Over the weekend, Downbelow’s resident PADI Course Director Richard Swann became PADI’s 1st member to qualify as an Instructor plus Instructor Trainer for Project AWARE’s new Shark Conservation Diver Distinctive Speciality. Time is not on the side of sharks, so Richard wasted none and immediately got on with spreading the word. 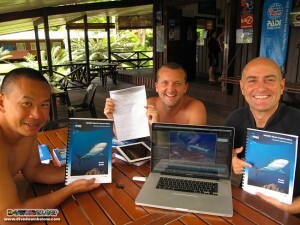 Our PADI Divemaster Interns Steve and Joseph were first to be taught by Project AWARE first Shark Conservation Speciality Instructor. They completed the course and in doing so claimed a 1st for themselves: the first divers to be qualified in this distinctive speciality. I think we heard sharks cheering. Having a resident community of black tip reef sharks only a few minutes by boat away from our PADI 5 Star IDC Dive Centre, the Shark Conservation Speciality is of particular interest to Richard. The Tunku Abdul Rahman Park, the marine park – just 10 minutes from Kota Kinabalu – in which our PADI 5 Star IDC Dive Centre is located, is a haven for all sorts of unexpected creatures. 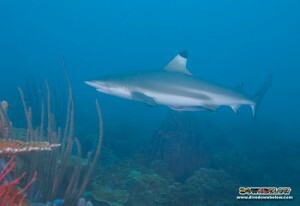 A community of black tip reef sharks just a few minutes by boat away from our dive centre counts amongst them. Richard has been swimming with these sharks since 2007 and reckons he’s seen about 25 individuals. Over the last year or so he has made more of a detailed study of these magnificent creatures and now has documented evidence of 15 distinct individuals. The picture of the shark accompanying this post was taken by Richard right here in the TAR park. To celebrate sharks and prepare you for the Big Shark Shout Out Week taking place from 15 – 23 October, Downbelow is offering the Project AWARE Shark Conservation Diver Distinctive Speciality Course at a special rate. Divers doing a day of diving with Downbelow can now add the Shark Conservation Speciality to their day, adding just the qualifying fee, which is only RM180 extra per person. Participants will receive all the learning materials, and 2 of your dives will then be where we normally spot our resident community of black tip reef sharks. Nature being nature – unpredictable and all – we can’t guarantee a sighting, but you can still achieve the rating with or without a shark sighting. Email us now to sign up for the Project AWARE Shark Conservation Diver Distinctive Speciality Course and get ready to enjoy Big Shark Shout Out Week!